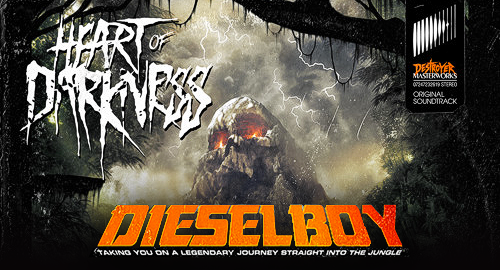 Dieselboy returns to deliver another mind-bending powerhouse of visionary drum and bass programming - the electrifying HEART OF DARKNESS! 28 years of World Tour DJ’ing with an obsessive focus on clever and creative mixing has driven him to craft this STAGGERING 91 minute / 124 track subsonic BEHEMOTH that pushes the boundaries of a DJ mix. Moving far beyond the traditional “linear” mixing model, Dieselboy has perfected a style of layering tracks that can only be described as “threaded” or “braided” - songs, loops and samples twist around one another in specific ways so that every element enhances those around it. With HEART OF DARKNESS the man has created an absolutely compelling audio experience - painting vibrant peaks, deep valleys and broad vistas of dense sonic textures designed to spellbound the intrepid listener. Come and take this incredible journey with him…DEEP INTO THE HEART OF THE JUNGLE!